Joel and his family began their search for a dream vacation home around 5 years ago. Residing in New Jersey, they enjoy traveling and exploring the great outdoors. The family did their research and waited for the perfect property to arise for spending the summers doing what they love most: being close to nature. When an opportunity to own a section of the pristine Adirondacks presented itself, they couldn’t turn it down. The family purchased 38 acres of woodlands on a small lake that was once part of an old Boy Scout camp. During the sales event for the property, the family met with Tim McLaughlin of Landmark Log Building, who was constructing the main gate to the properties at the time. After viewing some of his work and learning his technique of using natural logs scribed to each other without chinking, they knew that they wanted him to be the one to build their future dream vacation log cabin! Joel and his family wanted a custom built and designed vacation home, specifically for their family. Joel was to be his own General Contractor, working side by side with McLaughlin. Joel worked on the foundation, flooring, kitchen, utilities, plumbing and heating and Tim built and designed the log cabin exterior and all remaining projects. A lot of time was spent walking the property to ensure the optimum layout and design for the future vacation home. The main goal of the Log Cabin was to utilize the gorgeous views as much as possible. Mark Kennedy, Acucraft’s log cabin fireplace expert, was able to help them achieve this. 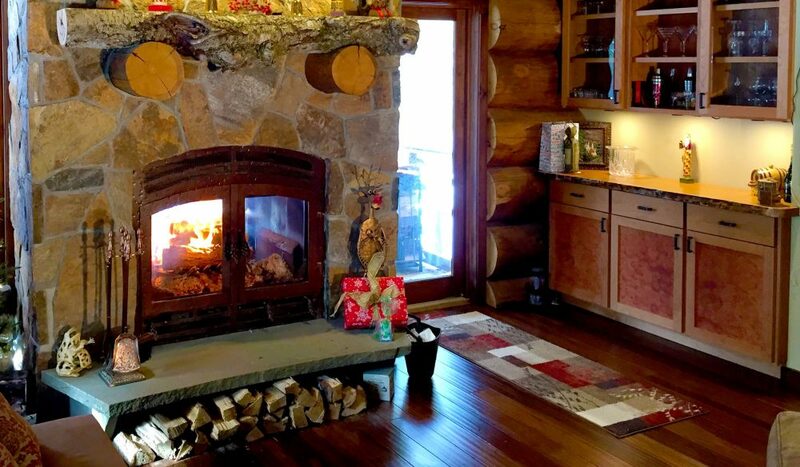 After speaking with Mark, Acucraft’s log cabin fireplace expert, they were educated in the technology, installation, and manuals regarding our products. The family ultimately decided on the wood burning indoor/outdoor fireplace: the Hearthroom 36 Indoor/Outdoor model. After craning in the fireplace, completing the log home around it, and putting on the final touches, the log cabin dream home is complete. We commend Joel and Tim’s craftsmanship on this gorgeous cabin that will be used for years to come. And we are proud that an Acucraft log cabin fireplace is in the spotlight. We want to congratulate Joel, his family, and Tim McLaughlin on completing this beautiful log cabin vacation home. And we are excited for Joel and his family to enjoy their indoor/outdoor fireplace for years to come with the most gorgeous views anyone could ask for.